When I found out about Kyoto, I felt like I had just discovered Royal Oak’s best-kept secret. While I pride myself on keeping important information hush-hush, I feel the need to share this special place with all of my Coneys and Kale readers! 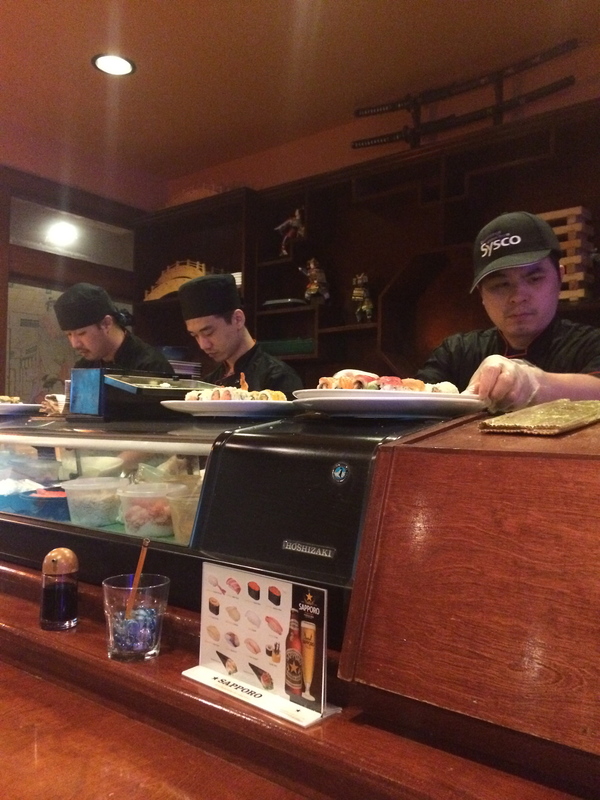 Kyoto serves up consistently tasty sushi, and they also have Hibachi grill tables, where you can watch your food being made right in front of you by talented chefs. I consistently go there on Monday nights for their half-off sushi menu, but the Hibachi experience is something I have always wanted to try. Kyoto’s Monday menu is filled with appetizers (edamame, soups, and salads), and a wide variety of sushi and sashimi. You really can’t beat the price, and the food is always tasty. My bill generally comes to $11-13 depending on how much I order. I always start with a bowl of edamame to share, and the miso soup. The miso soup is always nice and hot, with small pieces of tofu and a large rice noodle for some texture. Next comes the sushi. Last time I ate at Kyoto, I sat at the sushi bar, where I was able to watch chefs roll my dinner by hand! 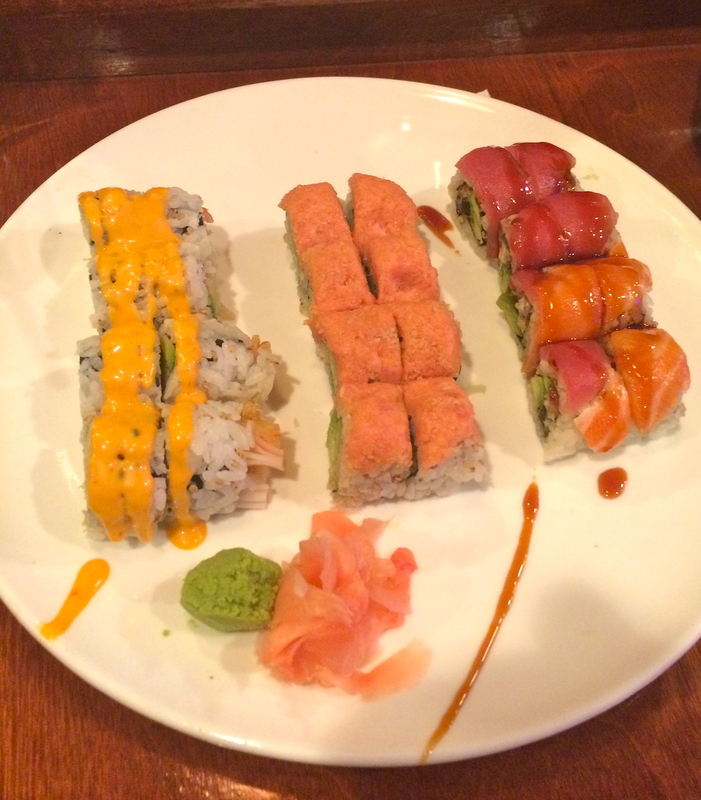 I try to switch it up every time, but the “Da Bomb” roll and the “Queen” roll are two of my go-to’s. Recently, I branched out and tried the “Tamago” (egg) and “Hamachi” (yellowtail) sashimi. Not my favorites, but if you’re a sashimi lover, Kyoto has plenty for you! Kyoto also has lunch specials, so if you work nearby, this is a perfect spot to bring some co-workers or to have a relaxing meal solo. And because the restaurant has plenty of seating, you generally won’t have to wait long (they do take reservations if you want to play it safe). The waitstaff are generally friendly, and speedy with your order. Cost: $11-30. HALF-OFF SUSHI ON MONDAYS! Hours: Mon.-Thurs. 11:00 am – 2:30 pm, 4:30 pm – 10:00 p.m., Fri. 11:00 am – 2:30 pm, 4:30 pm – 11:00 pm, Sat. 12:00 pm – 11:00 pm, Sun. 12:00 am – 10:00 pm.